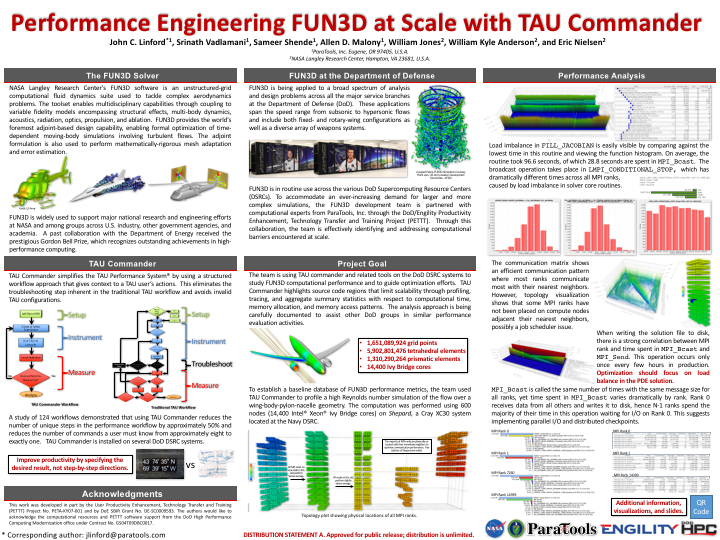 Performance Engineering FUN3D at Scale with TAU Commander – ParaTools, Inc. In partnership with Engility, Inc. and NASA Langley Research Center, ParaTools, Inc. will present a poster at SC'16 describing performance improvements in FUN3D realized via TAU Commander. Research posters display cutting-edge HPC research and are a prestigious piece of the SC event each year. According to SC organizers, only 65 percent of submissions were accepted. FUN3D is an unstructured-grid computational fluid dynamics suite widely used to support major national research and engineering efforts. FUN3D is being applied to analysis and design problems across all the major service branches at the Department of Defense. These applications span the speed range from subsonic to hypersonic flows and include both fixed- and rotary-wing configurations. This poster presents performance profiles of a high Reynolds number simulation of the flow over a wing-body-pylon-nacelle geometry on 14,400 cores of a Cray XC30 at the Navy DSRC. Profiles are gathered via TAU~Commander, which implements a new performance engineering methodology to improve user productivity. TAU~Commander highlights source code regions that limit scalability through profiling, tracing, and aggregate summary statistics with respect to computational time, memory allocation, and memory access. This analysis approach is being carefully documented to assist other DoD groups in similar performance evaluation activities.